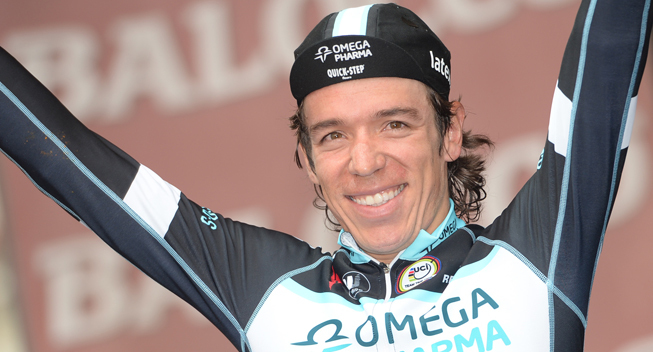 Rigoberto Uran went into today's queen stage of the Vuelta a Espana in a good position. However, the Colombian suffered from bronchitis and after losing more than 15 minutes, he is no longer in GC contention. La Vuelta a España Stage 16 was a particularly difficult one for Omega Pharma - Quick-Step Cycling Team. Wout Poels put up a fight, finishing 13th after a long day in the breakaway of the 160.5km queen stage. Alessandro De Marchi (Cannondale), and Poels were the last two riders of the original breakaway approaching the finish on Category 1 Lagos de Somiedo. But De Marchi eventually accelerated and Poels lost contact. De Marchi was caught in the final kilometers by an attacking Alberto Contador (Tinkoff-Saxo) and Chris Froome (Team Sky) and finished 3rd. Contador attacked Froome inside the final kilometer to win the stage. Rigoberto Uran, who came into the race in the top 10 of the GC, kept fighting back after losing contact thanks to the help of his teammates. However, he eventually lost contact on the second-to-last climb of the stage. Wout Poels and Gianluca Brambilla were both in the original breakaway. Brambilla and Ivan Rovny (Tinkoff-Saxo) were both disqualified for an altercation during the race. "I've struggled with bronchitis for five or six days now," Uran said. "Yesterday I suffered a lot, but today was by far the worst. I felt like I couldn't breathe. I thought about stopping already in the first climb. The easiest thing to do would be to abandon the race, but my teammates surrounded me and they helped me, step-by-step, catch the peloton again. "As a cyclist you have to fight through days like this. That's when you understand how hard it is to do this job. But it's part of the sport and I battled as much as I could. I did everything I could but on the second-to-last climb I couldn't follow the pace anymore. "I really am sad because there is a difference between mistakes that cost you goals in a race, and a sickness where there is nothing more you can do. I prepared appropriately for this objective. I worked hard. But in this condition I can't do better. "I want to stay optimistic despite this situation. Tomorrow is a day for me to recover. I will do everything I can to survive the next days, do as well as possible, and maybe aim for a good result in the final time trial of Santiago if I am feeling better." "It's a sad day for Rigo," Sport Director Davide Bramati said. "Rigoberto Uran did his best in difficult conditions. This morning we decided to put Wout Poels and Gianluca Brambilla in front to give him some help on the last climb. But early in the day we saw Rigo wasn't feeling well. "In the first two climbs Rigo suffered. The team did a good job to try and bring him to the finish. In the second-to-last climb he couldn't follow the peloton anymore, so at that point we tried to win the stage with Poels. It didn't work out, but that's cycling. In any case Rigo did a great race so far and we have a few days in front of us to try to fight for another good result, even if the GC is compromised."